Even before babies were part of the picture, when my husband and I first started dating, I felt compelled to began making a baby blanket from the hemp fabric swatches I had in my fabric pile. Almost seven years, and two babies later, the baby blanket is still tucked away in my sewing nook, waiting to be finished. I still love it like the first day I started sewing it together. For me it represents the love I felt for my husband and my, admittedly naive, quest for purity. That quest continued when I was expecting my first baby, as I daydreamed about creating a whole hemp nursery. This nursery was decorated with naturally coloured bedding and clothes, wooden toys and a home made driftwood mobile to complete the picture. In reality the nursery was brightly coloured with orange paint and a rainbow of plastic toys. Crib sheets, blankets and clothes were more often pre-loved than organic and a rough cut piece of black out cloth was tacked over the window. The nursery quickly filled with stuff and a lot of love and I did manage to find a few good hemp baby items along the way. One of my original indulges were a few hemp flannel cloth diapers by Sugar Peas. The design is great, simple, and has the typical inserts sewn right in, so there is no extra sorting while doing the laundry. I was particularly proud of myself for sewing up a few dozen hemp/cotton terry wash clothes to use for babe. I even went as far as to use yellow thread on the cloths I would use as bum wipes and purple thread to indicate bath or face cloths. Of course now that system is out the window and they are all used for cleaning up sticky hands and faces after meals. These wipes, although not pretty, have stood the test of time and are used and washed day after day in our house. 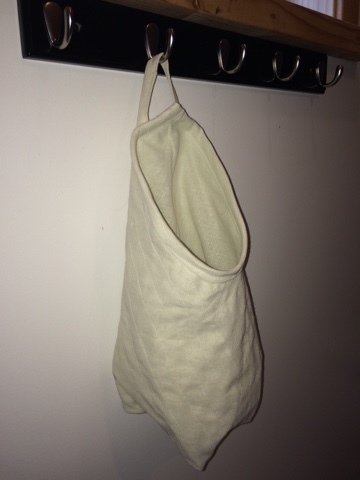 Now that I am a mother of two, my hemp baby collection has grown to include a hemp baby ring sling and baby hammock. I absolutely insisted that I finish making a baby hammock before baby number two arrived. The thought of baby napping in a hemp hammock that rocked them back to sleep ever so gently when they stirred was to beautiful not to try! The finished product had the desired effect when hung on the jolly jumper frame but it was baby number one doing all of the not so gentle rocking. As it turned out, baby number two prefers napping in the crib.